If any week demonstrated that school is a lot more than just learning in a classroom, it was this one! We started the week by showing our support to others, to show their own identity, by wearing odd socks. We did however, look at adding description into our writing by using adjectives, adverbs and similes. We have watched three different flashbacks and have created some very powerful pieces. We will be finishing the unit next week by putting together all of the conventions learnt, to write our final flashback. It was great to see everyone for Parents Evenings this week. It's great to have that communication throughout the year, and, like I said on the evenings, my door is always open if there is anything you want to share or ask. On Thursday, we went to Churchill Academy to have our first swimming session of the year. It was brilliant to see the class demonstrate other skills that I haven't seen from them before and also those who showed great determination to improve and gain in confidence in the water. 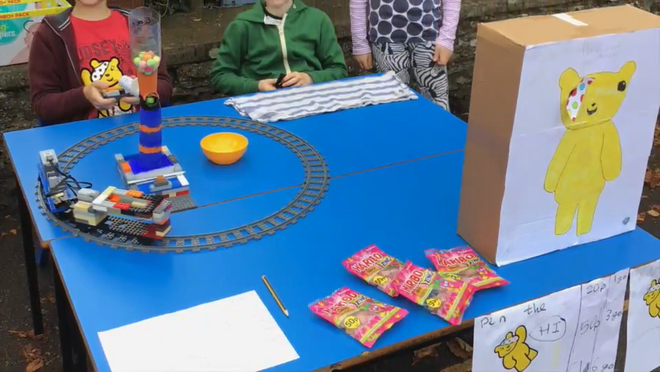 On the Friday, Class 4 showed me and the rest of the school again how fantastic they are by holding the annual Children In Need morning, where there were loads of great ideas, stalls and teamwork on show. I was so proud at their maturity and how much they helped the younger students. As a school, we raised a whopping £551.65!! For some reason, children decided to stay after school to swing a soggy sponge at their teacher... I have noted these names down for extra homework next week! A total of £91 was raised; 273 soggy sponges to be exact!! Please enjoy the video as a memory of your great effort. Again, you should be very proud of yourselves. Children up and down the country, who will be using your money, will definitely be thanking you. Have a great weekend and hopefully I will have dried off by then!